Greetings, dear readers, and happy Tuesday! 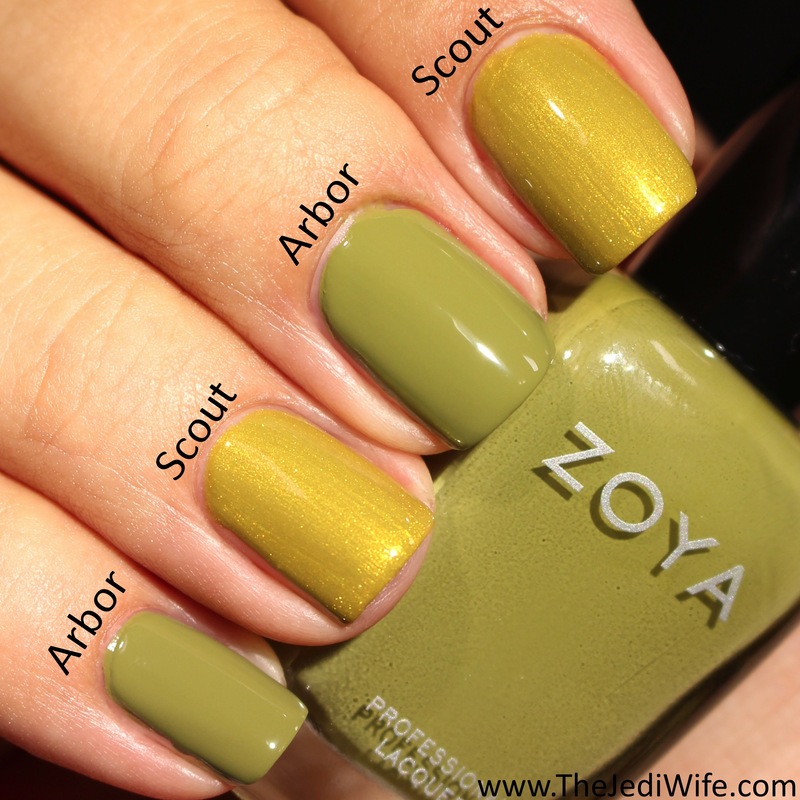 For today's blog post, I wanted to share the new Zoya Wanderlust nail polish collection by comparing the shades to each other. Some are similar on the nails, some are only similar while in the bottles, and others still are of similar type colour but with a different finish. It's been quite some time since I've done a blog post like this, but this particular summer collection just begged to have a compare and contrast post! Let's first start off with the shades that are obviously different and work our way towards those that look alike. 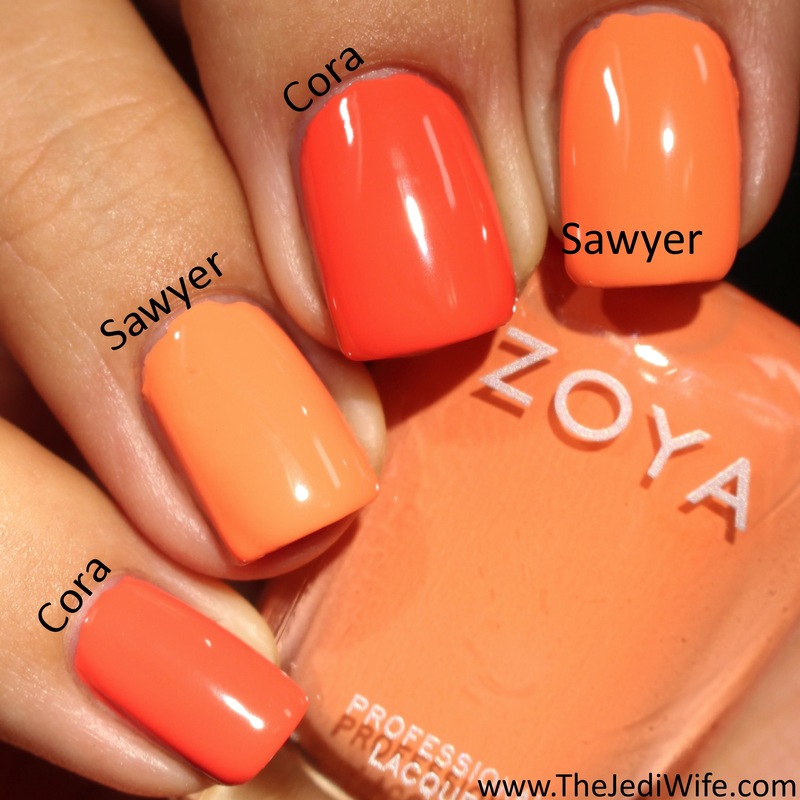 Cora and Sawyer are obviously not the same shade, both in the bottle and on the nail, but I chose to pair these two together since they both share a warm orange-type shade with the same creamy finish to boot. It's no secret on this blog that I love orange polish probably more than any other colour, so these are both winning shades in my opinion. They are definitely different enough to warrant owning both shades. 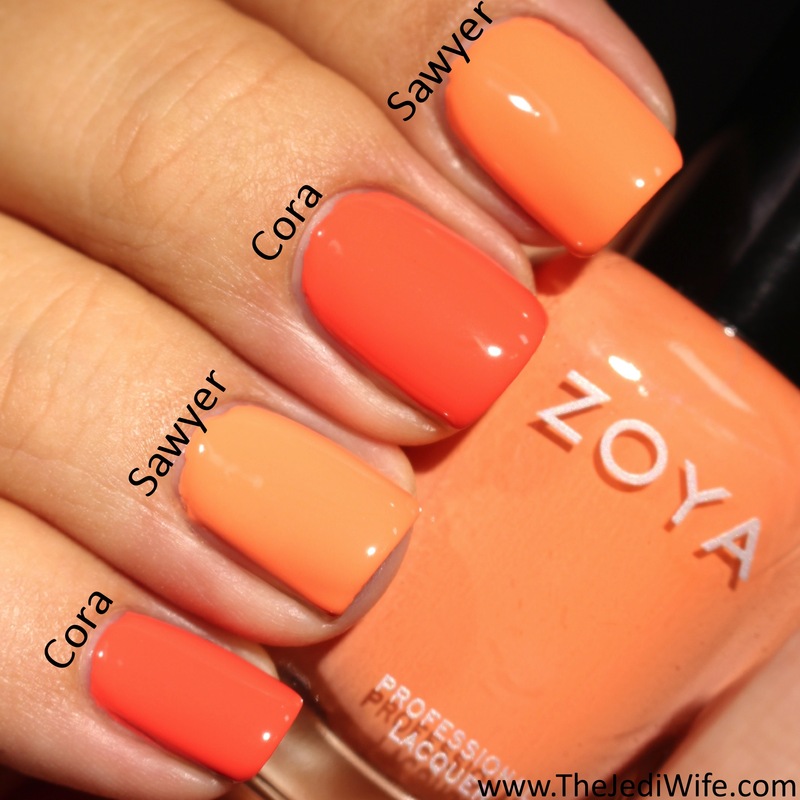 Cora is not a true orange and more of a muted orange-coral shade while Sawyer is described as a soft orange taffy cream. I am wearing three coats of each polish for these photos. If you're a fan of green shades, your options are limited to Arbor and Scout. I had hoped these polishes would be more of a similar vein with differing finishes, but Arbor is definitely cooler to the warm shimmering Scout. I'm personally having a hard time choosing a favorite between these colours as I adore the olive green colour of Arbor, but Scout just has more of a unique feel to me that keeps grabbing my attention. I am wearing two coats of both these polishes for these photos. 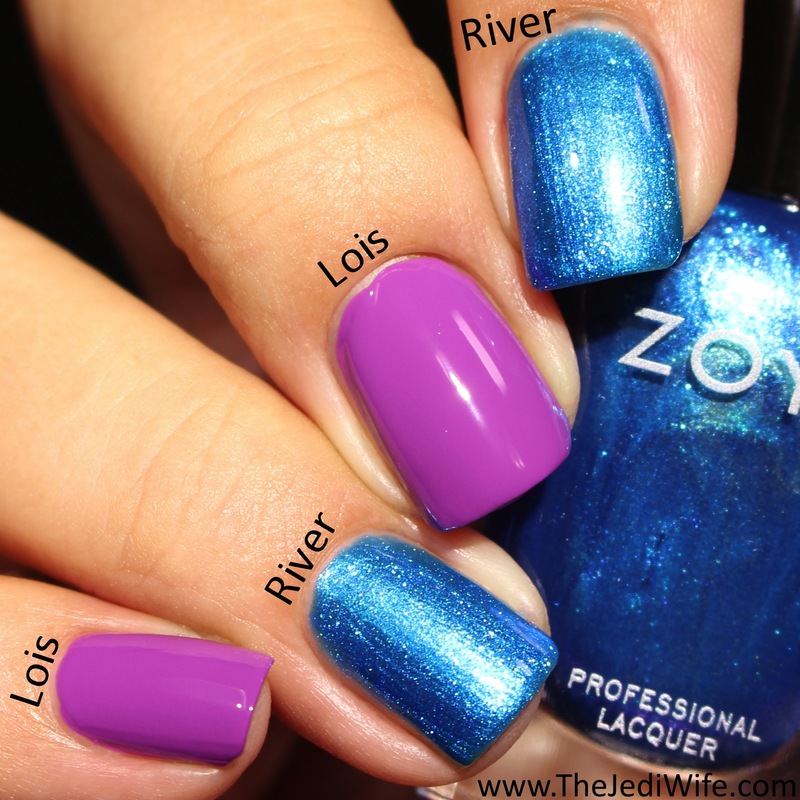 River and Lois look absolutely nothing alike in the bottle or on the nails, but I wanted to partner River with a shade from this collection for this post! A beautifully shimmering blue, River feels more like an outlier in this collction when compared with the remaining shades, although it does have a similar shimmering finish like many others in the Wanderlust collection. I'm wearing two coats of both shades for these photos. The closest match to Lois in the Wanderlust collection is Esty, and even then, these polishes are quite obviously different. In spite of that, these shades share in their colourful intensity and pair up together beautifully! I applied two coats of each shade to reach opacity for these photos. 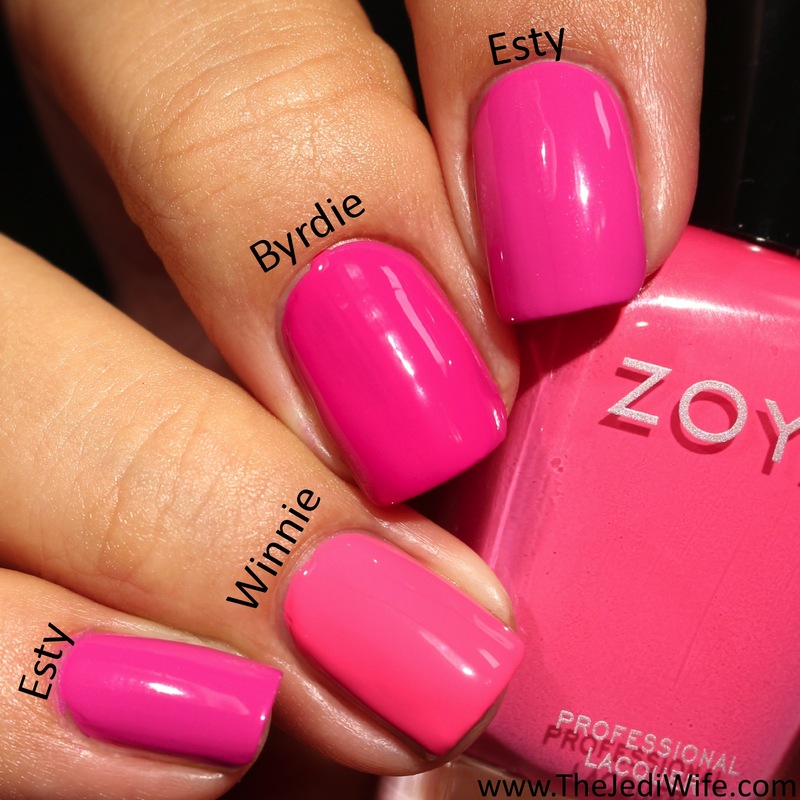 Esty, Winnie, and Byrdie is the combination I really wanted to put together when I first saw these bottles! After having all three shades applied to my nails, I can see the differences, but those with limited budgets likely will not need all three shades. Winnie is the most different as it is lighter and more of a watermelon shade than the remaining two. Esty and Byrdie are very similar, with Esty being a little more pink and Byrdie leaning fuchsia. The Zoya website describes Esty as a cream, but my bottle contains a subtle shimmer that whereas my Byrdie is a true cream. All three shades are worn at three coats for these photos. It was obvious from the start that Mandy and Byrdie were not the same shade, but I had to pair these two shades together after I had Mandy on my nails. While the base colour of Mandy is more berry-coloured, I noticed just how similar the pink shimmer it contained looked to the creamy pink of Byrdie. After pairing them together to test my theory, I can confirm this similarity. When I first saw Journey and Mandy in the bottle, I noticed the colours looked very similar to each other, with Journey more red and Mandy just a hint more berry coloured. 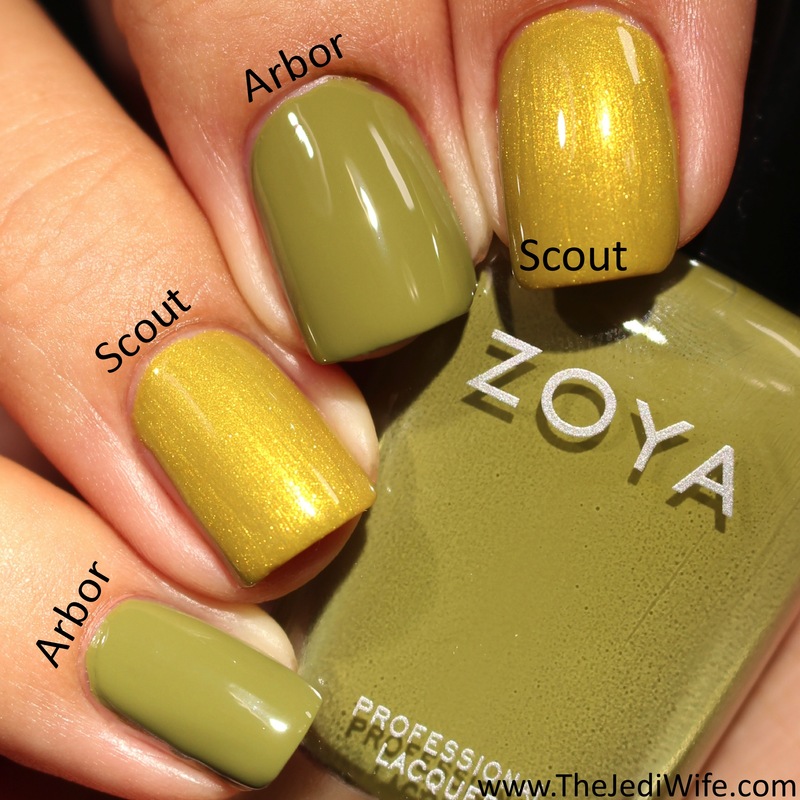 I was particularly eager to see just how different they looked once applied to the nails as Zoya polishes are notorious for looking similar in the bottle but radically different once applied. As you can see, there is a very clear different between Journey and Mandy once applied to the nails. I also added the cool red cream Sonja so you can see how well it plays off agains Journey. For these photos, I am wearing two coats each of Journey and Mandy and three coats of Sonja. 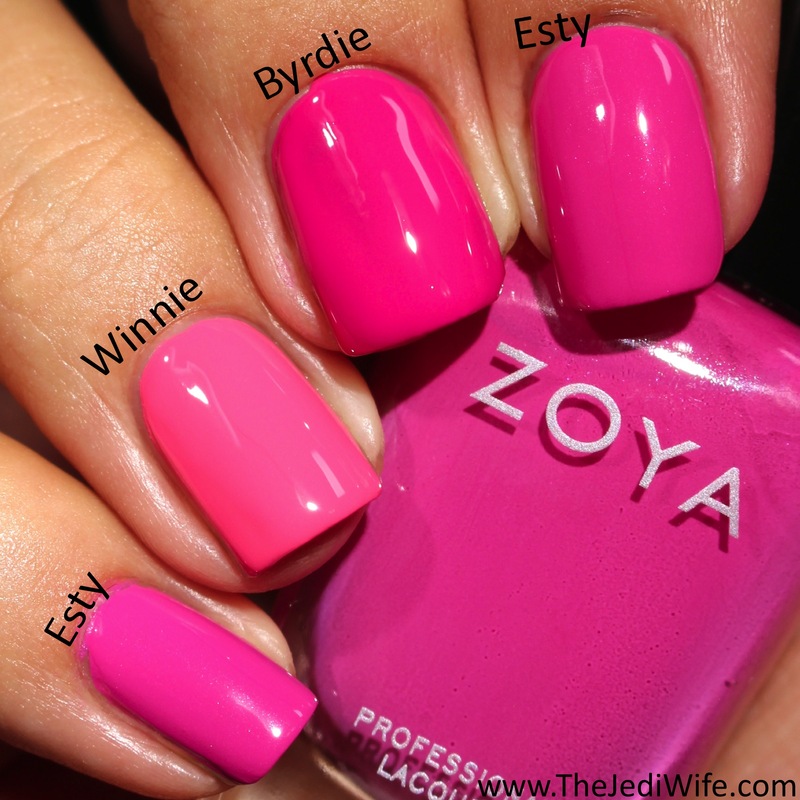 As you can see from these photos, Zoya is offering several beautifully bright shades that are not only perfect for the summer season, but they also play well with each other. While some shades share in similar characteristics, each shade is still different and offers something the others do not. I hope this post was helpful and informative in helping you select which shades you may want in addition to hopefully stirring up some colour combinations for nail art! I personally love to use multiple finishes in a ingle nail art design, and I'm hoping to find some time soon to get to do just that with a few of these shades! 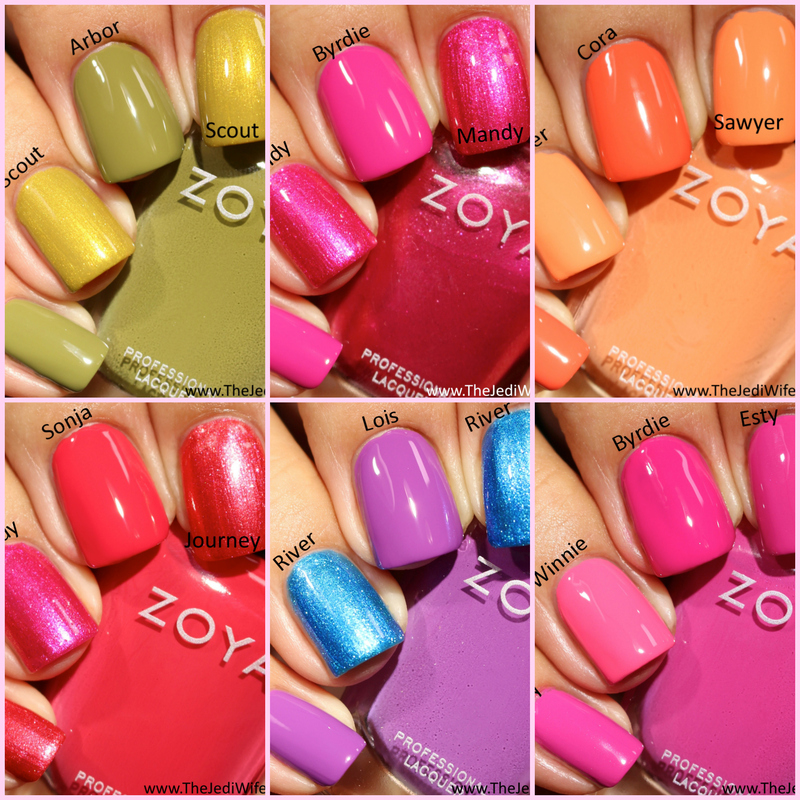 The Zoya Wanderlust Collection is available for purchase at zoya.com. The polishes in this collection retail for $10 each. Zoya currently has a promotion where you can buy any three nail polishes for $20 and receive a free Zoya lipstick and free shipping for US consumers. If you want to take advantage of this promotion, orders need to be placed by July 26th at 11:59pm ET using the discount code SFUN17. What shades are you loving this summer? Will you be picking up any of these with the promo code? I'd love to hear from you! I love comparisons. You should do more! The pink comparisons were so necessary. I've gotten a couple questions about those recently. The pinks were definitely similar so it's great to see them together. Great post. With so many pinks in this collection, it's nice to see them side by side. Yay - compare posts are fun! Love Zoyas - one of my fave main stream brands. I'm totally wearing pinks this summer. These comparisons just look like really fun manicures!! Thanks for such fabulous comparisons! The colors are gorgeous! I love the comparisons because a few of them do look similar in the bottle but they're definitely different on the nail!